Last month Grafton Primary School, near Holloway Road in North London, invited me to their Year Six Black History Month musical production based on my novel The Other Side of Truth. The audience was the entire school, children and staff, family members and friends... or, in the words of Grafton's head teacher Nitsa Sergides, the 'Grafton Family'. Nitsa is a remarkable headteacher with creativity and commitment to every child at the very heart of the school. Grafton employs a part-time writer-in-residence (Diane Samuels), artist-in-residence (Tessa Garland) and musician-in-residence (Juwon Ogungbe), each of whom works with the children on a weekly basis. How remarkable is that? I also recently learned that Nitsa was awarded an OBE in 2011 for services to education. In my dreams I would make her Secretary of State for Education with her teachers leading the whole department! 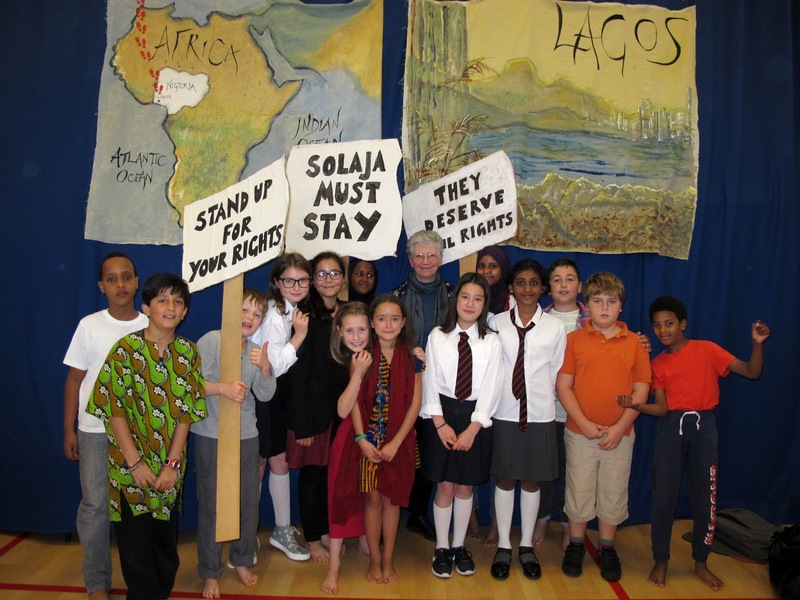 Well, one thing led to another and a couple of weeks into the autumn term all of Year Six at Grafton were working on a cross-curricular The Other Side of Truth project, culminating in their production before half-term. It was quite a feat... and I take my hat off to Juwon, and dedicated teachers Anna Sutton, Bea Symes, Justin Ward and others. With two classes, each presented one half of the story, hence two different actors for each main role, involving every child. I'll paste a few pictures below, with thanks to Tessa Garland. I wish you could hear the music too. At last, Sade and Femi reunited with Papa - but in prison? Some of the children will shine tomorrow and some, less confident at acting, will do their best at this stage in their young lives. However, more importantly every single one of them without exception, has learned a great deal from your story and every single child and adult has been moved to tears at some stage in the rehearsals. Personally, I can't watch the end without holding back the sobs and not always very successfully either! So touching 60 young lives and several old lives - this is success! Thank you, Grafton School! Your production was an amazing gift and I'm delighted to be counted part of the Grafton Family. Moreover, I still find myself humming some of Juwon's songs. May the journey continue.